Hull missed the chance to close the gap on Championship leaders Cardiff as they were convincingly beaten by Bolton. The Tigers saw their defence breached three times in the first eight minutes. Darren Pratley headed in a cross from Lee Chung-yong before influential midfielder Mark Davies added a second. Craig Dawson headed in from a corner and, although Robbie Brady's free-kick reduced the deficit, Dawson grabbed a second by flicking in as the Tigers slipped to third in the table. Victory extends the Trotters' unbeaten run to four matches as they moved up to 14th in the table, while Hull dropped behind Watford on goal difference following the Hornets' 2-1 win over Derby. Steve Bruce's City came into the game without conceding in their last two games, but now they are seven points behind Championship leaders Cardiff, who face Wolves on Sunday. Bolton broke the deadlock in the second minute when Davies played in Lee and his cut-back was powerfully headed home by Pratley. Davies then got on the scoresheet himself by unleashing a 18-yard shot that Tigers keeper David Stockdale got a hand to but could not keep out. Hull were shellshocked and in the seventh minute Dawson's glancing header was adjudged to have gone over the line before Marvin Sordell made sure. Sordell could have made it 4-0 but his shot came back off the post after he was played in by David Ngog. Brady hit a free-kick over the bar before finding his range, although his set-piece sliced through the Bolton wall into the bottom corner. And any hopes of a Hull comeback were dashed when the home side regained their three-goal advantage thanks to Dawson's flick into the bottom corner. 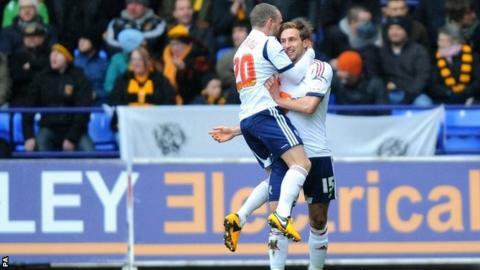 Bolton boss Dougie Freedman: "Craig Dawson has bought into what we are trying to do and he is a good guy. He has also brought a confidence to Zat Knight and Adam Bogdan. "When the ball gets crossed into crucial areas one of those three are dealing with it. He has got the presence to demand certain standards of people around him and he is bringing the best out of Zat." "It shows you what we are capable of and a result like this has been coming. It's been difficult for the players and the club since they suffered relegation. There has been a lot of expectation but I know how good they can be. It's just very pleasing to beat a good Hull team." Hull manager Steve Bruce: "I've had better days. That start is something you see at school. How can you explain it? It's one of those freak things. I have never been involved in something like that and I don't think it will happen again for a long time. "You have to erase it and say 'it happens'. Sometimes a kick up the backside doesn't do anyone any harm now and again. We have been rock solid for seven months. "But you know it's not your day when you score to make it 3-1 with 20-odd minutes to go and they go down the other end and score again. Bolton have got some good players yet when I looked this morning they were four points above the relegation area. That shows you how difficult this league is."